Lugetune, the farmstead or estate by the River Lea, was first mentioned in a document written c.1050. Domesday Book rendered the name as Leintune and it first appeared as Leyton in 1226. The village was later also known as Low Leyton, from its setting on the river’s flood plain; a patch of Leyton Marsh survives near Lea Bridge. 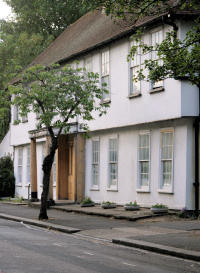 Walnut Tree House, also called Essex Hall, is probably the borough’s oldest structure – though there is no record of precisely when it was built or for whom. Its timber-framed core dates from roughly 1500, with matching wings added later. Shown in the photo below, the house is presently a private members’ club. St Mary’s church was built in 1658 but, like Walnut Tree House, it has since been much extended and altered. By the 18th century most of the marshes had been converted to fertile farmland, which was dotted with mansions, especially towards the area now known as Bakers Arms. There was little growth in the main village until the coming of the railway in the mid-19th century, which brought both indus­trial devel­opment beside the Lea and the construction of a lower middle-class dormitory suburb. Thereafter Leyton’s population doubled every decade for the rest of the century. In particular, its growth in the 1880s was the fastest of any comparably sized town in England. The borough built an Italianate-style town hall in 1882 but it quickly outgrew the premises and a new town hall opened next door in 1896. The older structure is now Leyton library; its successor is managed by the LVE charitable found­ation and serves as a weddings and events venue, rebranded the Great Hall. The opening of Midland Road station in 1894 sealed the fate of the big houses in the north of the district and by the 1920s barely a scrap of land in Leyton remained to be built upon. Heavy damage during the Blitz led to wholesale municipal recon­struction after the war, with the addition of tower blocks from 1961 onwards. Known in the past (especially the third quarter of the 20th century) for the manufacture of neckties, Leyton has also been home to the factories of Aquascutum and Thermos, but manufac­turing has declined in favour of service indus­tries over the last few decades. In 1991 Spitalfields market moved to a purpose-built 31-acre site off Ruckholt Road. New Spitalfields has the widest range of fruit, veget­ables and flowers of any British wholesale market. In advance of the 2012 Olympics, the council made various envir­on­mental improve­ments in and around High Road Leyton. The most imagin­ative aspect of the project was the revamping of 21 shopfronts, some of which are shown in the photo at the top, while more than 150 residents success­fully applied for grants of up to £1000 to spruce up the frontage areas of their homes. 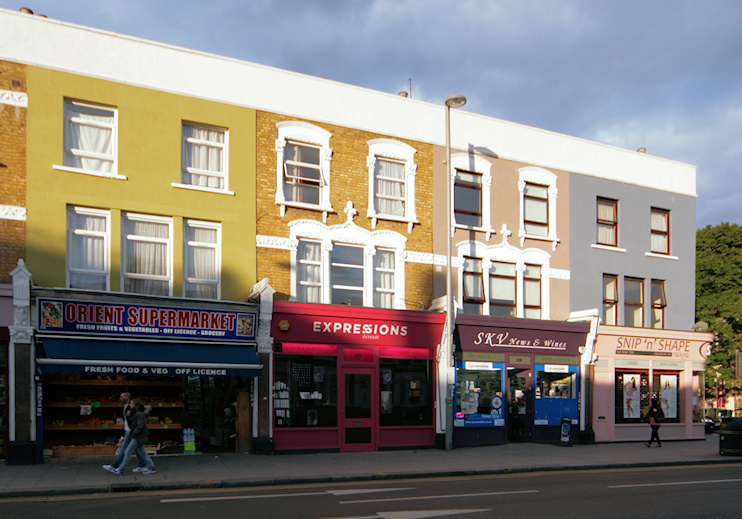 Waltham Forest council describes Leyton as “possibly the most diverse part of the borough” – and as one of its poorest areas. White residents make up around 36 per cent of Leyton’s population, and just over half of these are white British. The other main ethnic minor­ities are of Pakistani, black African and black Caribbean descent. The average age of Leyton’s residents is 31.7 years, which is relat­ively young. This is mainly the result of the large number of families with dependent children, including a high proportion of single-parent house­holds. Clapton Orient Football Club moved to Brisbane Road in 1937. The ‘Orient’ name had been the suggestion of a player who worked for the Orient Line shipping company, as it fitted the east London location. The club changed its name to Leyton Orient in 1946 and enjoyed its greatest period of success in the 1960s.